Endogenous mechanisms regulating the host response during inflammation resolution are critical in ensuring disposal of noxious stimuli and return to homeostasis. In this article, we engineered novel Annexin A1 (AnxA1)–based peptides, AnxA12–50, that displayed specific binding to the AnxA1 receptor (formyl peptide receptor 2/Lipoxin A4 receptor [FPR2/ALX]; IC50 ∼4 nM). Intravenous administration of AnxA12–50 markedly reduced (>60%) leukocyte adhesion to postcapillary venules in wild type and Fpr1−/−, but not Fpr2/Alx−/−, mice. Generation of a metabolically stable form of this peptide (CR-AnxA12–50), engineered by substituting a cleavage site shared by human proteinase 3 and neutrophil elastase, yielded an agonist that was resistant to neutrophil-mediated cleavage and displayed enhanced proresolving actions: accelerated resolution of self-limited inflammation and enhanced macrophage efferocytosis after sterile injury, when compared with AnxA12–50. These actions were retained with human primary leukocytes where CR-AnxA12–50 decreased neutrophil–endothelial interactions (∼25–45%), and stimulated neutrophil apoptosis and macrophage efferocytosis (∼45%). In murine cardiac ischemia/reperfusion injury, CR-AnxA12–50 elicited tissue-protective actions reducing infarct size (∼60%) and incidence of 24-h death. These results identify AnxA12–50 and CR-AnxA12–50 as FPR2/ALX agonists that harness the proresolving actions of AnxA1, and thus may represent therapeutic tools for treatment of inflammatory conditions. Acute inflammation represents a protective process mounted by the host in response to tissue damage and/or pathogenic infection (1, 2). This inflammatory response is usually beneficial resulting in clearance of the inflammatory stimulus, promoting wound healing and restitution of homeostasis (2, 3). It is now clear that inflammatory mechanisms and mediators do not dissipate spontaneously, but rather resolution involves tightly regulated and complex biochemical pathways that ensure timely disposal of inflammatory response initiating catabasis (2, 3). In a number of pathological conditions, including vascular reperfusion injury, this process may become too aggressive, resulting in uncontrolled inflammation and tissue destruction (2). Annexin A1 (AnxA1), a 37-kDa glucocorticoid regulated protein, possesses anti-inflammatory and proresolving actions reducing human (4) and murine (5) neutrophil–endothelial interactions, accelerating neutrophil apoptosis (6), stimulating macrophage efferocytosis (7) and neuroprotection (8). Consistent with this notion, AnxA1-deficient mice display inappropriate inflammatory responses in a number of disease models including experimental autoimmune encephalomyelitis (9), cerebral ischemia reperfusion (10), and nociception (11). In patients suffering from ulcerative colitis, AnxA1 expression at the site of tissue injury is upregulated during remission, suggesting a role in wound repair (12). These homeostatic functions of AnxA1 are mediated by formyl peptide receptor 2/Lipoxin A4 receptor (FPR2/ALX), a G protein–coupled receptor (GPCR) that is shared with the proresolving lipid mediators Lipoxin A4, RvD1, and their aspirin-triggered epimers (13, 14). Upon calcium binding, AnxA1 undergoes conformational change with exposure of the N-terminal domain, which can then interact with FPR2/ALX. This portion of the protein is susceptible to cleavage by proteolytic enzymes, including human proteinase (PR) 3 (15) and neutrophil elastase (HNE) (16), leading to AnxA1 inactivation. Peptides modeled on the N-terminal sequence of AnxA1 possess anti-inflammatory properties when administered in murine models of inflammation and afford protection against ischemia/reperfusion injury (10, 17). With human cells, AnxA1 peptides inhibit neutrophil recruitment onto activated endothelial monolayers (4), primary monocyte activation (18), and stimulate macrophage efferocytosis (7). Yet, these peptides display much lower potency than the parent protein (for review, refer to Ref. 19). The reduced potency displayed by short AnxA1 peptides is attributable to low binding affinity to the AnxA1 receptor and lack of receptor specificity, because they bind with similar potency the cognate receptor FPR1 (20, 21). In this study, we investigate the bioactions of AnxA1-derived peptides that span the full N-terminal region and present evidence for their FPR2/ALX-specific, potent anti-inflammatory, proresolving, and tissue-protective actions. All animal studies were conducted with ethical approval from the Queen Mary University of London Local Ethical Review Committee and were conducted in accordance with the U.K. Home Office regulations (Guidance on the Operation of Animals, Scientific Procedures Act, 1986) and the Animal Care Ethical Committee of the 2nd University of Naples. Human cells were prepared according to a protocol approved by the East London and the City Local Research Ethics Committee (Ref. 05/Q0603/34 East London and the City Health Authority, London, U.K.). Glycine-extended ANXA12–50 and CR-AnxA12–50 were designed for cloning and expression using vectors for extracellular expression in Escherichia coli. The designed genes were synthesized by DNA 2.0 (Menlo Park, CA) using their codon optimization algorithm, followed by single amino acid modifications using PCR in the noted constructs. The vector design for these constructs was based on the vector presented in Ray et al. (22), such that the gene of interest is encoded in dual cassettes with each cassette composed of dual promoters and a signal sequence preceding the gene of interest, and dual transcription termination sequences following the gene of interest. The digenic plasmid construct of each analog was used to transform the E. coli host strain, BLM6L, resulting in expression strains for each analog gene construct. These recombinant cell lines were screened for kanamycin resistance and growth at 37°C in a semidefined inoculation media, as described in Ray et al. (22); the plasmid constructs were confirmed with diagnostic restriction enzyme mapping, and final isolates were screened in shake flask experiments for the extracellular production of the peptide of interest, using an anion-exchange chromatography–HPLC assay. Selected isolates were further evaluated in bench scale fermentations. Each fermentation was run as a substrate-limited, fed batch run with the induction of recombinant protein achieved using the chemical inducer, isopropylthio-β-galactosidase, which was incorporated into the feed. The fermentation was run under standard conditions of 32°C, pH 6.6, and dissolved oxygen at 80% by supplementation with O2 in media as described previously (22). These fermentations were assayed and, in some cases, harvested between 23 and 31 h postinduction. For purification, the fermentation was acidified and chilled; the conditioned media were harvested by centrifugation for downstream processing as described by Ray et al. (22). The level of endotoxin present in the recombinant peptides was determined using the kinetic chromogenic Limulus amebocyte lysate method, U.S. Pharmacopeia. Endotoxin was quantified using the Endochrom-K test kit (Charles River Laboratories). Samples of endotoxin standard were prepared at 5, 0.5, and 0.05 endotoxin unit/ml. Peptide samples were dissolved at 1 mg/ml in PBS and diluted to 1:6, 1:60, and 1:600. Standards and samples were treated with limulus amebocyte lysate containing a p-nitroaniline substrate and incubated at 37°C. The absorbance was measured at 405 nm. The level of endotoxin was determined by comparison with the standard curve. Interference testing was performed by spiking all samples with 0.5 endotoxin unit/ml; spike recovery was determined to be 80–105%. The level of endotoxin was determined to be less than the limit of detection. HNE (PN 342-40; Lee BioSolutions) digests were conducted at a final reaction volume of 0.5 ml. Recombinant AnxA1 peptides were dissolved in 25 mM HEPES pH 7.5 at a final concentration of 0.5 mg/ml. Digests were initiated by the addition of HNE (0.19 U/ml; mass ration 1:161). Each digest was incubated at 37°C for 1 h. Aliquots (50 ml) were removed at 0–60 min and acidified by the addition of 10 ml 6% trifluoroacetic acid (TFA). Time points were analyzed by reverse phase–HPLC. For liquid chromatography–mass spectrometry (LC-MS) analysis, digests were terminated by acidification with 80 ml 6% TFA. Human PR3 (PN 497-50; Lee BioSolutions) digests were conducted at a final reaction volume of 0.25 ml. Recombinant AnxA1 peptides were dissolved in 25 mM HEPES pH 7.5 at a final concentration of 0.5 mg/ml. Digests were initiated by the addition of PR3 (0.0003 U/ml; mass ration 1:640). Each digest was incubated at 37°C for 1 h. Aliquots (25 ml) were removed at 0, 10, 20, 30, 40, 50, and 60 min, and acidified by the addition of 5 ml 6% TFA. Time points were analyzed by RP-HPLC. For LC-MS analysis, digests were terminated by acidification with 40 ml 6% TFA. HNE and PR3 digests of AnxA12–50 were analyzed by LC-MS. LC-MS analyses were conducted by SGS M-Scan (West Chester, PA). Aliquots (45 ml) of each acidified digest were injected onto an RP-HPLC column. Chromatography was carried out on a Thermoelectron BDS Hypersil C18 column (Thermo Fisher Scientific), 5 mm, 120 Å (4.6 × 250 mm). Peptides were separated using a linear gradient from 0% A (0.1% TFA) to 50% B (0.08% TFA, 80% TFA) over 75 min. The column was operated at ambient temperature at a flow rate of 1.2 ml/min. The column effluent was monitored sequentially by UV detection at 220 nm (Waters Acquity diode array detector), followed by electrospray ionization–mass spectrometry (Waters LCT Premier TOF mass spectrometer) operated in the positive ion mode. In designated experiments, human neutrophils (50 × 106/ml) isolated from peripheral blood (see below) were incubated at 37°C, pH 7.45, with 0.5 mg of either AnxA12–50 or CR-AnxA12–50 and leukotriene B4 (10 nM) for the indicated time intervals. The incubations were stopped by snap freezing in liquid nitrogen, and peptide levels were determined by RP-HPLC as outlined earlier. Binding experiments were conducted as in Hayhoe et al. (4). In brief, FPR1-HEK– or FPR2/ALX-HEK–transfected cells (1 × 106 cells/ml) were incubated with increasing concentrations of cold AnxA12–50 (0.1 nM to 10 μM) or CR-AnxA12–50 (0.1 nM to 10 μM) and a fixed concentration (50 nM) of [125I]-Tyr–Ac2-26 for 1 h (4°C). Bound and unbound tracers were separated by filtration through Whatman GF/C glass microfiber filters (Kent, U.K.) using a vacuum manifold, and assessment of tracer bound on cells was quantified by counting filters in a gamma counter. Ligand–receptor interactions were also monitored using the β-Arrestin PathHunter system (Discoverx) with experiments conducted as in Krishnamoorthy et al. (14), with HEK cells stably overexpressing recombinant human FPR2/ALX receptors tagged with a prolink label of β-galactosidase (β-gal) and β-arrestin linked to the enzyme acceptor fragment of β-gal. In brief, cells were plated in 96-well plates (20,000 cells/well) 24 h before initiating experiments. Test compounds were incubated with cells (60 min, 37°C), and receptor activation was determined by measuring chemiluminescence using the PathHunter detection kit (Discoverx). Neutrophils were isolated as previously described (4). These were fluorescently labeled using PKH26 membrane intercalating dye following manufacturer’s instructions, and apoptosis was induced by overnight incubation in DPBS (containing 1.3 mM Ca2+ and Mg2+, 37°C) at a concentration of 5 × 106/ml. Macrophages were differentiated from human peripheral blood monocytes, after isolation with a monocytes enrichment kit as per manufacturer’s instructions (StemCell) yielding 93–97% CD14+ population, by following a 7-d culture protocol in the presence of 10 ng/ml GM-CSF. On day 7, macrophages were treated with either vehicle (0.01% DMSO), AnxA12–50 (100 pM), or CR-AnxA12–50 (100 pM) for 15 min before addition of labeled apoptotic PMNs at a 3:1 ratio. Cells were incubated for 60 min at 37°C, then washed three times with ice-cold PBS, and macrophage efferocytosis was assessed as a function of fluorescence by flow cytometry. In a separate set of experiments, mice were injected with 1 ml of a 2% BioGel (BioRad Laboratories, Hemel Hempstead, U.K.) solution i.p. ; 4 d later, the peritoneum was lavaged using PBS + 3% EDTA. Cells were then passed through a 70-μm strainer to remove any remaining BioGel and washed twice with PBS. These were then plated in a 24-well plate at 0.5 × 106 cells/well and left to adhere for overnight. Macrophages were then treated with vehicle, AnxA12–50 (10 nM, 100 pM, or 100 fM), or CR-AnxA12–50 (10 nM, 100 pM, or 100 fM) for 15 min. Then 3 × 106 labeled apoptotic PMNs were added per well and cells incubated for a further 60 min at 37°C. The extracellular fluorescence was quenched using trypan blue, and extent of phagocytosis was assessed using a NOVOstar microplate reader (BMG LABTECH, Aylesbury, U.K.). Isolated neutrophils (5 × 106/ml) were incubated with either vehicle (PBS containing 0.01% DMSO), AnxA12–50 (100 pM), or CR-AnxA12–50 (100 pM, 20 min, 37°C, RPMI+10% FCS) and then cultured overnight with or without SAA (10 μg/ml, 37°C, 5% CO2). The extent of neutrophil apoptosis was determined using apoptosis detection kit (BD Biosciences) following manufacturer’s instructions. Male CD1 mice (6–8 wk of age; Charles River) were used for all the following experiments. Dorsal s.c. air pouches were prepared as described in Dalli et al. (23). PBS (PBS+0.01% DMSO), AnxA12–50 (0.5 to 500 ng/mouse), or CR-AnxA12–50 (0.5 to 500 pg/mouse) were administered i.v. 10 min before intrapouch administration of IL-1β, 10 ng in 500 μl 0.5% CMC (BDH, Dorset, U.K.). After 4 h, lavages were collected and the number of extravasated neutrophils was assessed by light microscopy and flow cytometry as described by Dufton et al. (24). Peritonitis was initiated in CD1 male mice, 6–8 wk old, by i.p. injection of Zymosan A (1 mg), and leukocyte counts were assessed by light microscopy and flow cytometry at 4, 12, 24, and 48 h as described earlier. In designated groups, mice were treated with PBS (PBS+0.01% DMSO), AnxA12–50 (0.5 μg), or CR-AnxA12–50 (0.5 μg) i.p., and leukocyte counts were assessed at the indicated times. C57BL/6, Fpr1−/− (25) or Fpr2/Alx−/− (24) mouse cremaster muscle microcirculation was prepared for intravital microscopy as by Chatterjee et al. (26). The cremaster was then mounted on a Zeiss Axioskop FS microscope and superfused with PBS (37°C, 30 min). A suitable postcapillary venule (wall shear rate ≥ 500 s−1, diameter 20–40 μm, length ≥ 100 μm) was selected, PBS (PBS-0.01% DMSO), AnxA12–50 (0.5 μg/mouse), CR-AnxA12–50 (0.5 μg/mouse), or hrAnxA1 (10 ng/mouse) was injected i.v. and the microcirculation monitored continuously for 10 min assessing the number of adherent leukocytes to the vascular endothelium as described by Gavins et al. (27). Human peripheral blood PMNs and HUVECs were isolated as in Dalli et al. (23). The HUVECs were plated in 35-mm dish until confluent and then incubated with human recombinant TNF-α (10 ng/ml, 4 h; R&D Systems). Before flow, PMNs were suspended at 1 × 106/ml in Dulbecco’s PBS and incubated with PBS (PBS + 0.01% DMSO), AnxA12–50 (0.1 pM to 10 nM), or CR-AnxA12–50 (0.1 pM to 10 nM) for 10 min, 37°C. PMNs were perfused over the HUVEC monolayers (8 min, 1 dyne/cm2), then six fields were recorded for 10 s. Total number of interacting PMNs was assessed as in Hayhoe et al. (4). In designated experiments, PMNs were incubated for 10 min with anti-FPR2/ALX (10 μg/ml, clone FN-1D6-A1; Genovac, Freiburg, Germany), or isotype controls, mouse IgG1 (BD Biosciences) before incubation with PBS, AnxA12–50 (100 pM), or CR-AnxA12–50 (100 pM) and perfused over activated endothelial cells. Murine myocardial ischemia was induced as by Gavins et al. (27). After a 25-min period of myocardial ischemia by closing the left anterior descending coronary artery, the clip was removed so that the tension on the ligature was released and reperfusion occurred for 2 or 24 h. PBS (PBS + 0.01% DMSO), AnxA12–50 (5 μg/mouse), or CR-AnxA12–50 (5 μg/mouse) was administered as indicated via i.v. injection, with plasma and tissues harvested either 2 or 24 h after reperfusion. Incidence of mortality was also recorded in the 24-h reperfusion protocol. Plasma levels of Troponin I (Bio-Quant, San Diego, CA), CCL5, and IL-1β (R&D Systems, Abingdon, U.K.) were measured by ELISA following manufacturer’s instructions. Two or 24 h after reperfusion, the left anterior descending coronary artery was reoccluded and injected with Evans blue dye (1 ml, 2% w/v) staining the perfused and viable myocardium, leaving the occluded and necrotic vascular bed uncolored. The heart was removed, and the left ventricle was excised and weighed. This was then sectioned and the area at risk was separated from the nonischemic myocardium. The area at risk was cut into small pieces and incubated with NBT (0.5 mg/ml, 20 min, 37°C), to distinguish between ischemic and infarcted tissue. Data are presented as mean ± SEM. Statistical analysis was performed using the paired, unpaired Student t test, or one-way ANOVA followed by a Dunnett’s post hoc test. Survival analysis was conducted by the χ2 test. In all instances, p < 0.05 was considered to be significant. DNA sequences encoding peptides encompassing the first 50 aa of the AnxA1 N terminus were designed and cloned in a recombinant E. coli expression system. The expressed peptides were recovered from culture supernatant, purified, C-terminally amidated, and tested for endotoxin contamination that demonstrated no detectable endotoxin levels (<0.300 endotoxin units/ml) in the any of the peptide batches after purification (see Ref. 20 for details). We next determined whether this new peptide was able to bind the AnxA1 receptor, FPR/ALX. In binding assays with FPR2/ALX transfected cells (4), AnxA12–50 displaced tracer ([125I]-Ac2-26) (13) with high affinity (IC50 = 4 nM; Fig. 1A). Incubation of AnxA12–50 with FPR1-HEK cells did not produce specific competition curves (Supplemental Fig. 1A). We next investigated the receptor–ligand interactions, using a GPCR–β-arrestin–coupled system where the Pro-Link peptide of β-gal and β-arrestin are linked to the enzyme acceptor fragment of β-gal. 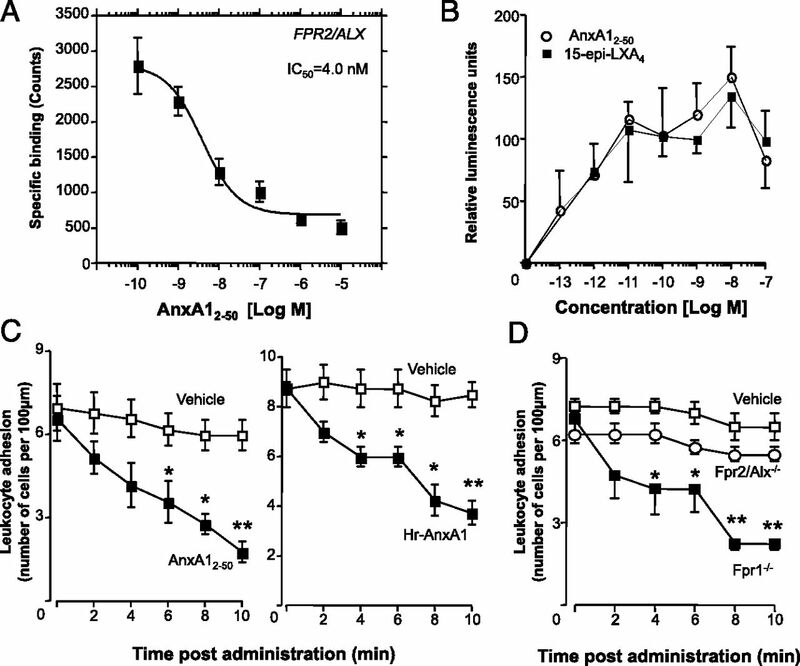 Incubation of FPR2/ALX–β-arrestin cells with AnxA12–50 gave a dose-dependent increase in the interactions of β-arrestin and the receptor in these cells to a similar extent as the potent proresolving lipid mediator 15-epi-lipoxin A4 (Fig. 1B). Because engagement of FPR2/ALX by AnxA1 leads to the activation of the MAPK/ERK pathway (4), we next sought evidence for receptor agonism by AnxA12–50 observing phosphorylation of ERK upon incubation with FPR2/ALX transfected cells (Supplemental Fig. 2). AnxA12–50 binds and activates FPR2/ALX exerting potent anti-inflammatory actions in vivo. (A) Binding affinity of AnxA12–50 to human FPR2/ALX overexpressing in HEK cells was assessed in a competitive binding assay using [125I]–Ac2-26. (B) Agonist activity for AnxA12–50 and AT-LXA4 was investigated using β-arrestin stably expressing FPR2/ALX (results are mean ± SEM of 3–4 independent experiments). IL-1β (50 ng) was injected intrascrotally (i.s.) 2 h before i.v. administration of (C) AnxA12–50 (0.5 μg/mouse) or AnxA1 (10 ng/mouse) to C57B6 wild-type mice. (D) In designated experiments, AnxA12–50 (0.5 μg/mouse) was administered to Fpr1−/− or Fpr2/Alx−/− mice. The number of adherent leukocytes was assessed at the indicated time points over a 10-min interval (see Materials and Methods for details). Results are mean ± SEM of n = 4 mice per group (*p < 0.05, **p < 0.01, versus vehicle group). Full-length AnxA1 exerts potent leukocyte-directed actions in vivo (28); therefore, we investigated whether AnxA12–50 also displayed anti-inflammatory properties. Administration of this peptide (0.5 μg i.v. per mouse) markedly reduced the number of adherent leukocytes to the inflamed cremaster postcapillary venule, reproducing the actions of the parent protein (Fig. 1C). These potent anti-inflammatory actions were retained when AnxA12–50 was administered to mice lacking the Fpr1 receptor, but not to animals deficient in the murine homolog of FPR2/ALX, termed Fpr2/Alx−/− (24) (Fig. 1D). Collectively, these results demonstrate that AnxA12–50 binds and activates the AnxA1 receptor, exerting potent anti-inflammatory actions in vivo. Because the N-terminal portion of AnxA1 is a substrate for neutrophil-derived, PR-mediated cleavage and inactivation (15, 16), we next assessed the cleavage of AnxA12–50 by HNE and PR3. This analysis demonstrated that cleavage at the C-terminal side of Val25 was prominent and a common recognition site for both enzymes (Fig. 2A, Supplemental Table I). We next cloned a peptide sequence where Val25 was substituted with leucine and investigated whether this new peptide displayed a higher stability to enzymatic digestion by activated human neutrophils when compared with AnxA12–50. Incubation of AnxA12–50 with human peripheral blood neutrophils stimulated with LTB4 led to a time-dependent conversion of this peptide, whereby after 30 min ∼20% of the initial amount was detected in these incubations (Fig. 2B). Incubation of the Val25 to Leu25 substituted peptide with human neutrophils also led to a time-dependent reduction in the amount of peptide detected in the incubations. Of note, this peptide displayed significant resistance to metabolism by activated human neutrophils when compared with AnxA12–50, with only ∼45% loss of the initial amount at the 30-min interval (Fig. 2B), thus yielding a cleavage-resistant form of AnxA12–50, which we termed CR-AnxA12–50. Substituting Val25 on AnxA12–50 yields a peptide with enhanced resistance to neutrophil-mediated cleavage. (A) Principal cleavage sites on AnxA12–50 were identified after incubation with either HNE or PR3 (see Supplementary Table IA, IB). (B) AnxA12–50 or PR-resistant AnxA12–50 (0.5 mg/ml) were incubated with human neutrophils (50 × 106/ml) activated with LTB4 (10 nM), at 37°C and pH 7.45 for the indicated time intervals, and peptide levels determined by online UV-HPLC (see Materials and Methods for details). Results for (A) are representative of n = 4. Results for (B) are mean ± SEM of n = 4 distinct incubations with different neutrophil preparations. *p < 0.05, **p<0.01 versus AnxA12–50 incubations. We next assessed the binding affinity of CR-AnxA12–50 obtaining an apparent IC50 of ∼7 nM to FPR2/ALX (Fig. 3A) overexpressing cells with no tracer displacement being observed when human FPR1 overexpressing cells were used (Supplemental Fig. 1B). In addition, CR-AnxA12–50 promoted a concentration-dependent increase in the interactions of β-arrestin and FPR2/ALX, as measured by an increase in luminescence in cells overexpressing the receptor tagged to the β-arrestin system (Fig. 3B). 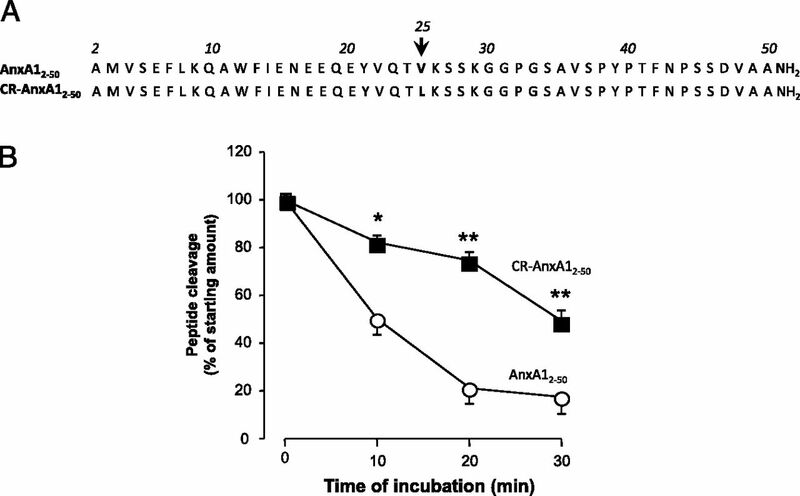 This peptide also retained the agonistic activities of AnxA12–50 whereby incubation of CR-AnxA12–50 with cells overexpressing the AnxA1 receptor led to an increase in ERK phosphorylation (Supplemental Fig. 2). Cleavage-resistant AnxA1 peptide selectively binds to FPR2/ALX and displays anti-inflammatory actions. (A) Binding affinity of CR-AnxA12–50 toward human FPR2/ALX was assessed by competitive binding assay using [125I]–Ac2-26. (B) Agonist activity of CR-AnxA12–50 was investigated using β-arrestin stably expressing FPR2/ALX (results are mean ± SEM of 3–4 independent experiments). Mice were treated with vehicle (saline containing 0.01% DMSO) or the indicated i.v. doses of (C) AnxA12–50 or (D) CR-AnxA12–50 5 min before administration of IL-1β (10 ng) into 6-d-old dorsal air pouches. Exudates were collected after 4 h, and the number of recruited neutrophils was quantified by light microscopy and flow cytometry (see Materials and Methods for details). Results are mean ± SEM of n = 4 mice per group; *p < 0.05, **p < 0.01, versus vehicle group. Having found that CR-AnxA12–50 binds and activates the AnxA1 receptor, we next investigated the anti-inflammatory actions of this novel peptide. i.v. administration of AnxA12–50 or CR-AnxA12–50 (0.5–500 ng) led to a dose-dependent reduction (50–75%) in the number of neutrophils migrated into dermal air pouches in response to intradermal IL-1β administration (Fig. 3B). We next assessed the ability of these novel peptides to accelerate the endogenous resolution programs using well-defined indices during self-resolving zymosan-initiated peritonitis (29). Administration of zymosan (1 mg) led to rapid neutrophil infiltration that peaked at 12 h (Tmax) and, after 24 h, was reduced by 50% (half Tmax), giving a calculated resolution interval (Ri) of 12 h. i.p. administration of AnxA12–50 (5 μg/mouse) at the peak of inflammation led to a reduction in the number of neutrophils recovered from the peritoneum at 24 and 48 h after zymosan administration that reached statistical significance at the 48-h interval when compared with vehicle-treated mice, giving an Ri of 9 h (Fig. 4A, 4B). Administration of CR-AnxA12–50 also led to a reduction in exudate neutrophil counts collected at 24 and 48 h after zymosan administration, which reached statistical significance at the 48-h interval when compared with both vehicle-treated mice and AnxA12–50–treated animals, shortening Ri to 7 h (Fig. 4A, 4B). Novel AnxA1 N-terminal–derived peptides display potent proresolving actions. (A) Mice were treated with either vehicle (saline containing 0.01% DMSO), AnxA12–50 (0.5 μg/mouse), or CR-AnxA12–50 (0.5 μg/mouse), 12 h after i.p. injection of 1 mg zymosan. Number of neutrophils recovered from the peritoneal cavity was determined at the indicated times by light microscopy and flow cytometry (see Materials and Methods). (B) Twenty-four–hour peritoneal exudate neutrophil counts in mice treated with vehicle, AnxA12–50 (0.5 μg/mouse), or CR-AnxA12–50 (0.5 μg/mouse). (C) The extent of macrophage efferocytosis was assessed in 24-h exudates of mice treated as in (A) by flow cytometry (see Materials and Methods for details). (D) Wild-type or Fpr2/Alx−/− bone marrow–derived macrophages were incubated with PBS, AnxA12–50, or CR-AnxA12–50 (100 pM, 30 min, 37°C, pH 7.45) before the addition of labeled apoptotic neutrophils (1 h, 37°C, pH 7.45). Results are mean ± SEM (A, n = 4 mice per group per time point; C and D, n = 4 mice); *p < 0.05, **p < 0.01, versus vehicle group; #p < 0.05, versus corresponding AnxA12–50 group. One fundamental mechanism regulating resolution of acute inflammatory responses is clearance of apoptotic cells by macrophages (2). Thus, we monitored macrophage efferocytosis ex vivo in murine self-resolving exudates. AnxA12–50 (∼30%) and CR-AnxA12–50 (∼40%) significantly increased the number of macrophages containing PMNs (F4/80+, Ly6G+ events) at 24 h after zymosan administration (Fig. 4C). This action was mediated by the mouse Fpr2/Alx because neither of the peptides stimulated macrophage efferocytosis in macrophages from mice lacking the murine ortholog of human FPR2/ALX (Fig. 4D). Together, these results demonstrate that Val25 to leucine substitution yielded peptides with increased resistance (increased half-life) to serine proteases that were endowed with agonistic activity at human FPR2/ALX and elicited Fpr2/Alx-mediated anti-inflammatory and proresolving actions in vivo. To investigate the translational potential of our findings, we next tested the actions of AnxA12–50 and CR-AnxA12–50 on human primary leukocytes. We first assessed their actions on neutrophil recruitment to activated endothelial cells, as monitored under shear stress conditions. Both AnxA12–50 and CR-AnxA12–50 reduced neutrophil recruitment to activated endothelial monolayers (Fig. 5A), decreasing the number of rolling (Supplemental Fig. 3A) and firmly adherent (Supplemental Fig. 3B) neutrophils. Of note, CR-AnxA12–50 demonstrated higher potency at inhibiting neutrophil–endothelial interactions displaying significant efficacy even at 100 fM (Fig. 5A). These actions were reliant on human FPR2/ALX because incubation of neutrophils with a receptor-specific neutralizing Ab before exposure to the peptides significantly reduced their actions on neutrophil recruitment (Fig. 5B, Supplemental Fig. 3C, 3D). AnxA12–50 and CR-AnxA12–50 exert anti-inflammatory and proresolving actions on human leukocytes. (A) Neutrophils were prepared from peripheral blood of healthy volunteers (see Materials and Methods) and incubated with the indicated concentrations of AnxA12–50 or CR-AnxA12–50 for 15 min at 37°C (pH 7.45). Cells were then perfused over HUVEC monolayers incubated with human recombinant TNF-α (4 h, 37°C, pH 7.45). Neutrophil endothelial cell interactions were documented over 10-s intervals, and the number of cells captured was determined offline. (B) In designated experiments, neutrophils were incubated with anti-FPR2/ALX or isotype control Ab (5 μg/ml, 15 min, 37°C, pH 7.45) before incubation with 100 pM AnxA12–50 or CR-AnxA12–50 and perfusion over the endothelial monolayer. Cell interactions were analyzed as described earlier. (C) Neutrophils were incubated with PBS, AnxA12–50, or CR-AnxA12–50 (100 pM, 20 min, 37°C, pH 7.45), then cultured with or without SAA (10 μg/ml) for 24 h at 37°C. Apoptosis was assessed by propidium iodide and Annexin V staining. (D) Human monocyte-derived macrophages were incubated with PBS, AnxA12–50, or CR-AnxA12–50 (100 pM, 30 min, 37°C, pH 7.45). Subsequently, labeled apoptotic neutrophils were added for 1 h (37°C). Nonphagocytosed cells were washed, and extracellular fluorescence quenched using trypan blue and phagocytosis determined on a plate reader. Results are mean ± SEM of n = 4 independent cellular preparations (*p < 0.05 versus PBS, **p < 0.01 versus respective 100 pM incubations). Inflammatory stimuli at the site of inflammation extend neutrophil half-life, an action that can be counter-regulated by proresolving mediators including AnxA1 and lipoxins (30). We therefore investigated whether AnxA12–50 or CR-AnxA12–50 could override the antiapoptotic effect of SAA on human neutrophils. Incubation of neutrophils with AnxA12–50 (100 pM) significantly reversed SAA-induced neutrophil survival leading to a significant increase in the number of apoptotic cells after 18-h incubation (p < 0.01; Fig. 5C). This proresolving bioaction was also observed when cells were incubated with CR-AnxA12–50 (∼2.5-fold increase in apoptotic neutrophils; p < 0.01; Fig. 5C). Acceleration of neutrophil apoptosis is of little impact to the dynamics of inflammation if it is not coupled with efferocytosis, because neutrophils would eventually become necrotic and reiterate inflammatory circuits (2). Thus, we investigated this phenomenon using human macrophages. Incubation of human primary macrophages with either AnxA12–50 or CR-AnxA12–50 led to a significant increase (>40%) in the extent of phagocytosed apoptotic neutrophils (Fig. 5D). Collectively, these results demonstrate that both AnxA12–50 and CR-AnxA12–50 afforded genuine proresolving actions on human leukocytes likely mediated by agonism at FPR2/ALX. Ischemia/reperfusion injuries are events of major clinical importance with a pathogenic contribution by aberrant leukocyte activation (31). To evaluate the tissue-protective actions in murine ischemia/reperfusion injury of both AnxA1-derived peptides, we occluded the left anterior descending coronary artery for 25 min. Initially, a 2-h reperfusion protocol was used, delivering AnxA12–50 or CR-AnxA12–50 (5 μg/mouse) at the beginning of reperfusion. Assessment of cardiac viable tissue by NBT staining (viable tissue stains are red, whereas damaged tissue remains white) demonstrated marked damage to the cardiac muscle (Fig. 6A, white arrows), an effect visibly reduced after administration of CR-AnxA12–50. The tissue-protective actions of AnxA12–50 and CR-AnxA12–50 resulted in a significant reduction in infarct size (Fig. 6B; 50–70%; p < 0.01). This reduction in tissue damage correlated with an attenuation in circulating levels of Troponin I (Fig. 6C), a clinically relevant marker of myocardial infarction, and the proinflammatory mediators CCL5 (RANTES) and IL-1β (Fig. 6D, 6E). AnxA1-derived peptides afford cardioprotection in murine ischemia reperfusion. The mouse left descending coronary artery was occluded for 25 min, immediately before reperfusion animals were treated i.v. with saline, AnxA12–50 (5 μg/mouse), or CR-AnxA12–50 (5 μg/mouse). Tissues were obtained 2 h after reperfusion, and the area at risk and infarct size were determined (see Materials and Methods for details). (A) Representative images of infracted myocardium for PBS- and CR-AnxA12–50–treated mice. (B) Quantitative analyses for tissue damage expressed as infarct size/area at risk. Plasma levels of (C) Troponin I, (D) CCL5, and (E) IL-1β at the end of the 2-h reperfusion period. Results are mean ± SEM of n = 6 mice per group (**p < 0.01 versus PBS group). We next established the therapeutic potential of CR-AnxA12–50 using a protocol that better reflects the clinical scenario. Mice were treated with 5 μg CR-AnxA12–50 1 h into reperfusion, and plasma cytokine/chemokine levels were assessed 24 h later. Treatment with this peptide led to a significant reduction in circulating levels of Troponin I (58%; p < 0.01; Fig. 7A), CCL5 (48%; p < 0.01; Fig. 7B), and IL-1β (65%; p < 0.01; Fig. 7C). These effects on humoral responses were reflected in a marked reduction in 24-h infarct size (52%; p < 0.01; Fig. 7D) accompanied by enhanced (60%) survival (Fig. 7E). 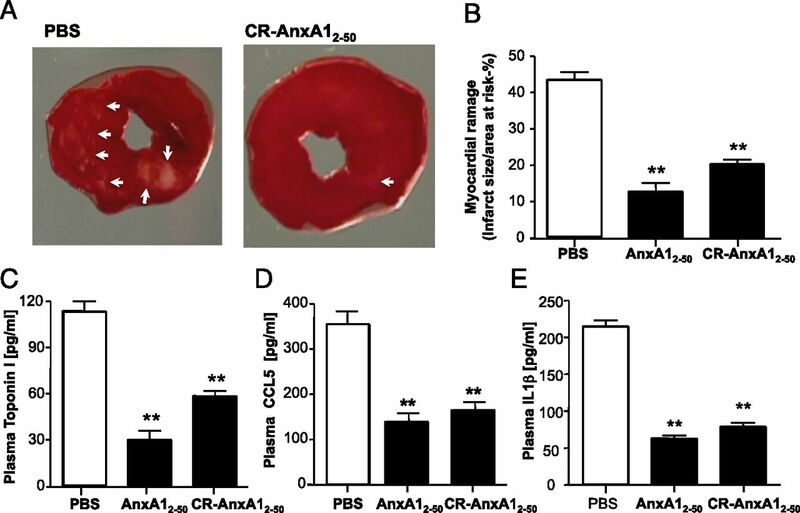 These results reveal protective actions elicited by both AnxA1 peptides, with CR-AnxA12–50 displaying tissue-protective actions when administered in a clinically relevant model of cardiac ischemia/reperfusion injury. CR-AnxA12–50 protects from death after cardiac ischemia/reperfusion injury. Mice were treated 1 h after reperfusion with either saline or CR-AnxA12–50 (5 μg/mouse), and 24-h plasma levels of (A) Troponin I, (B) CCL5, and (C) IL-1β were assessed. (D) The left ventricle was excised and the extent of tissue damage was assessed (see Materials and Methods for details); (E) survival was assessed over the 24-h time period postreperfusion. Results are mean ± SEM of n = 6 mice per group (**p < 0.01 versus PBS group). In this study, we engineered and characterized two novel AnxA1-based peptides, AnxA12–50 and CR-AnxA12–50, which displayed high affinity and selectivity for FPR2/ALX, affording potent anti-inflammatory and proresolving actions in murine and human systems. These actions were, at least in part, responsible for the protection afforded by both peptides in murine myocardial ischemia/reperfusion injury. We began the study by testing the natural sequence AnxA12–50, finding that this peptide displayed selectivity for human FPR2/ALX and exerted potent leukocyte regulatory actions. The AnxA1 N-terminal region is the site of attack by many proteases that may either lead to the inactivation of the protein (15) or release of peptides endowed with distinct bioactions to the parent protein (32). Thus, we assessed cleavage of AnxA12–50 by human PR3 and HNE, two enzymes associated with pathogenesis in vascular (33) and lung (34) diseases, but also abundant in inflammatory exudates (15, 16). At variance from AnxA1, which in similar experimental settings is cleaved at positions 11, 22, and 36 (35), the shorter 50-aa-long sequence revealed a novel cleavage site at position 25. We reason that the less complex conformation of AnxA12–50, compared with full-length AnxA1, would unmask this cleavage site. Thus, CR-AnxA12–50 was generated with the conservative substitution of Val25 to leucine. This amino acid displays similar physical properties to valine so that its insertion would exert minimal effects on the overall conformation of the peptide, which is essential for binding affinity and receptor specificity. 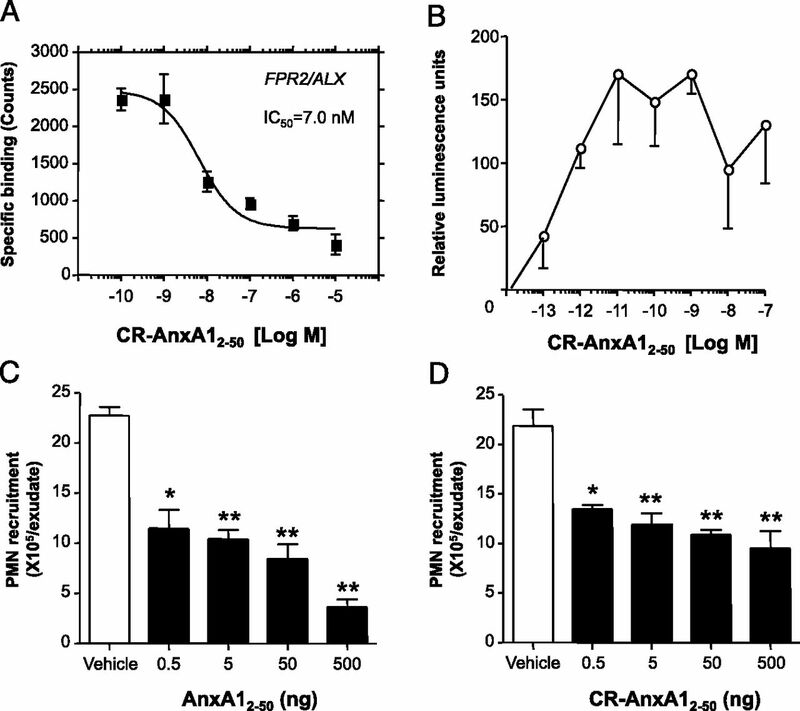 Congruently, CR-AnxA12–50 displayed enhanced resistance to PMN proteolytic activity (Fig. 2), likely resulting from resistance to PR3 and HNE because both these enzymes use Val25 as a cleavage site and in view of preliminary findings obtained with CR-AnxA12–50 and recombinant PR3 and HNE (data not shown). Notably, this amino acid substitution conserved the specificity of this peptide to selectively bind and activate the AnxA1 receptor with high affinity (IC50 of 7 nM). The higher affinity of AnxA12–50 and CR-AnxA12–50 toward FPR2/ALX might derive from the length of these peptides compared with shorter published sequences (e.g., see Ref. 19). This suggests that the active conformation of the pharmacophore residing in the AnxA1 N terminus, which is exposed when the protein changes conformation upon binding to calcium and acidic phospholipids (36), is better retained in the 50-aa-long peptides. AnxA12–50 and CR-AnxA12–50 did not display specific binding toward human FPR1, in contrast with the shorter AnxA1-derived peptides that bind with low affinity (low micromolar range) to both FPR1 and FPR2/ALX (4, 21). Of note, the finding that these peptides are bioactive at concentrations lower than the ones required for the displacement curves in binding assay is an apparent discrepancy that arises from the use of a heterogeneous tracer, a feature already noted for the parent protein AnxA1 (4). This is further supported by the results obtained using the β-arrestin reporter system, which demonstrates that both AnxA1-derived peptides bind and activate the β-arrestin reporter at concentrations within their bioactive range and with similar potency to that displayed by the potent proresolving mediator 15-epi-LXA4 (Figs. 1, 3). In addition, we found that both AnxA12–50 and CR-AnxA12–50 functionally activated the AnxA1 receptor leading to the activation of the MAPK pathway and phosphorylation of ERK, in a manner similar to AnxA1 (4). Uncontrolled neutrophil recruitment to the site of infection or inflammation could lead to tissue damage and perpetuation of an inflammatory response. Administration of either AnxA12–50 or CR-AnxA12–50 led to a dose-dependent reduction in neutrophil recruitment to the site of inflammation, with AnxA12–50 displaying a higher efficacy than CR-AnxA12–50 (Fig. 3), that may, at least in part, reflect the higher affinity of the native peptide to the AnxA1 receptor (Figs. 1, 3). Leukocyte recruitment to the site of inflammation during self-limited inflammation follows well-defined dynamics, whereby following edema formation that occurs within the first few minutes, neutrophils rapidly infiltrate into the affected site followed by mononuclear cells (29). Using well-established indices (29), we tested the ability of AnxA12–50 and CR-AnxA12–50 to accelerate the endogenous host protective programs (proresolving actions), administering these peptides at the peak of inflammation and assessing leukocyte levels over the subsequent 12–36 h. We observed that both peptides significantly accelerated neutrophil clearance from the peritoneal cavity, with CR-AnxA12–50 displaying the highest efficacy at accelerating the endogenous resolution programs leading to a reduction in the number of neutrophils recovered from the peritoneal exudates (Fig. 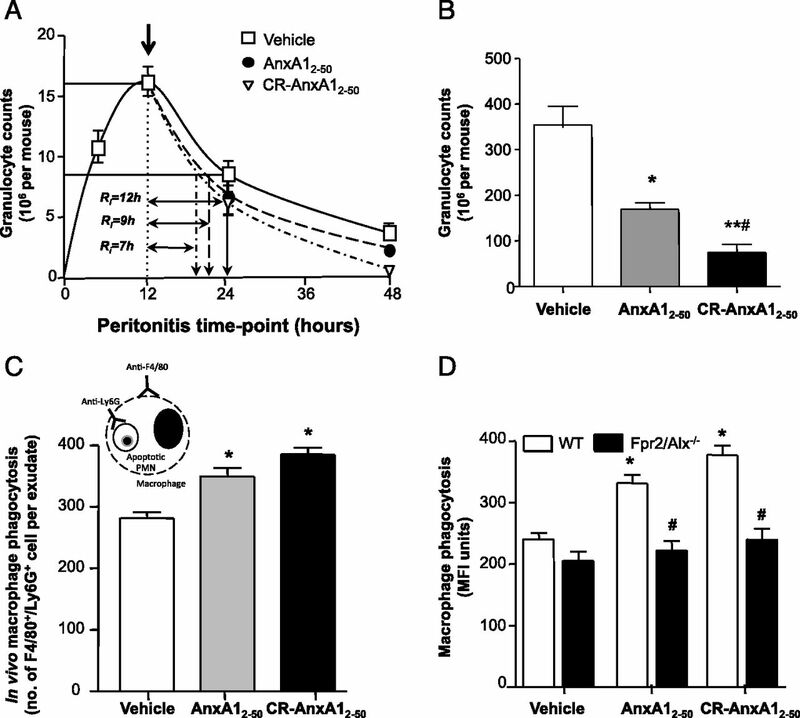 4), resulting in a shortening of the Ri by 5 h. This enhanced ability of CR-AnxA12–50 to engage endogenous resolution programs over AnxA12–50 can be explained by the higher metabolic stability displayed by this peptide to neutrophil-mediated cleavage. Clearance of apoptotic cells and debris by macrophages is a critical process occurring during resolution that is regulated by a number of endogenous resolution agonists including Resolvin D1 (14), hydrogen sulfide (37), and indeed, AnxA1 (7). AnxA12–50 and CR-AnxA12–50 were both found to potently regulate murine macrophage efferocytosis in vivo and in vitro. This action was also mediated by FPR2/ALX, because this proresolving action of AnxA12–50 and CR-AnxA12–50 was lost in mice that lack the murine orthologs of this receptor. It was also important to determine whether the potent regulatory functions determined in murine systems were translatable to human settings. Incubation of AnxA12–50 or the serine protease-resistant form with human peripheral blood neutrophils demonstrated that these peptides displayed potent actions in regulating neutrophil recruitment to an activated endothelial monolayer. In this study, we found that CR-AnxA12–50 displayed elevated inhibitory actions at the lower concentrations tested when compared with AnxA12–50. In addition, we found that these actions were also mediated by FPR2/ALX, because blockade of this receptor on neutrophils abolished the antiadhesive actions of both peptides, in line with the actions reported for the full-length protein (4). Both peptides were found to display a bell-shaped concentration–response in their ability to inhibit neutrophil recruitment to activated endothelial cells (Fig. 4; Supplemental Fig. 3). These actions are in concurrence with those described for AnxA1 (35) and other protective endogenous mediators, including Resolvin D1 and Lipoxin A4 (14), which activate the same GPCR, and suggest that under specific conditions the presence of these mediators above a given threshold concentration may not lead to an increase in their protective actions. This may result from distinct signaling mechanisms elicited by an agonist at different concentrations that may include coupling to different G proteins, which will result in the activation of different signaling pathways. Having established the anti-inflammatory actions of these new peptides on human leukocytes, we next assessed their potential proresolving properties. Indeed, elevated local levels of proinflammatory mediators in inflammatory exudates can lead to aberrant neutrophil activation and reduce programmed death, favoring perpetuation of tissue damage with the downstream risk for chronic inflammation (3). Serum amyloid A, an acute-phase protein that is used as a marker of disease activity and severity in a number of chronic diseases, is one of the mediators able to promote neutrophil recruitment (6, 30) together with extending their persistence at the site of inflammation (6). 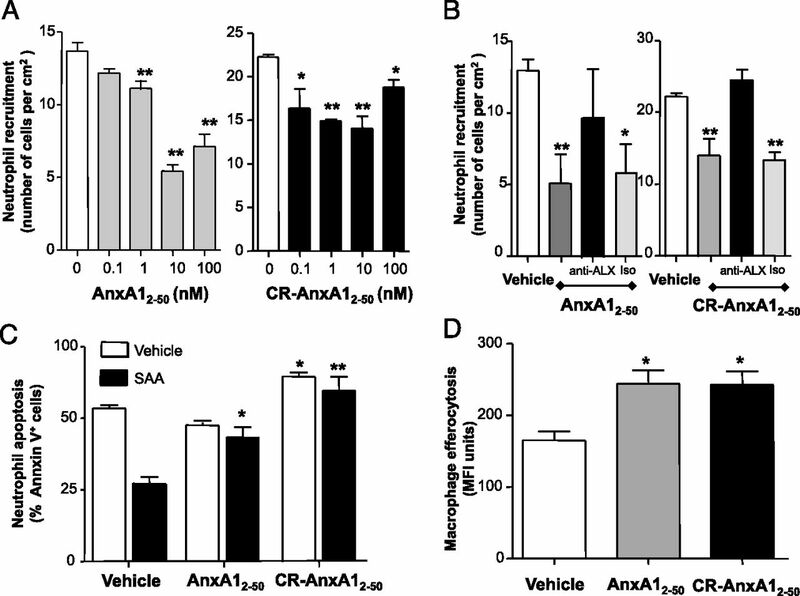 AnxA12–50 and CR-AnxA12–50 potently reversed the antiapoptotic actions of SAA. Of note, this action was accompanied by appropriate stimulation of human macrophage efferocytosis. In view of the pivotal roles that apoptosis (38) and efferocytosis (2) play in inflammatory resolution, these experiments were important to define the correct pharmacology of these novel AnxA1-derivatives, allowing us to identify them as proresolving peptides. The anti-inflammatory and proresolving actions of these novel peptides are in line with the actions displayed by the potent anti-inflammatory and proresolving mediators LXA4 and AT-LXA4 that are both FPR2/ALX agonists (14, 39). Notably, it has recently been demonstrated in that serum amyloid A, another FPR2/ALX may blunt the anti-inflammatory actions of LXA4, which, in turn, may mediate glucocorticoid refractory lung inflammation in patients with chronic obstructive pulmonary disease (39). These findings further underscore the complexity of ligand–receptor interactions mediated by FPR2/ALX that may lead to the activation of specific signaling pathways, ultimately resulting in functionally distinct cellular responses. Ischemic events result in the release of soluble mediators by damaged tissue that leads to unabated leukocyte activation and propagation of tissue damage that can ultimately result in organ failure (40). Administration of either AnxA12–50 or CR-AnxA12–50 before reperfusion potently attenuated myocardial damage as demonstrated by reduced necrotic tissue and circulating Troponin I. These actions were coupled with a reduction in systemic inflammatory markers, findings that are concurrent with protective actions afforded by AnxA1 during ischemia/reperfusion injury in a number of murine models (10, 27). Repair of damaged tissue and prevention of further damage by mediators released from necrotic cells is also critical to ensure organ protection after ischemia/reperfusion injury (41). The AnxA1 pathway also exerts direct protective actions on cardiomyocytes preserving resting contractile function after metabolic inhibition (42) or exposure to proinflammatory mediators (43). 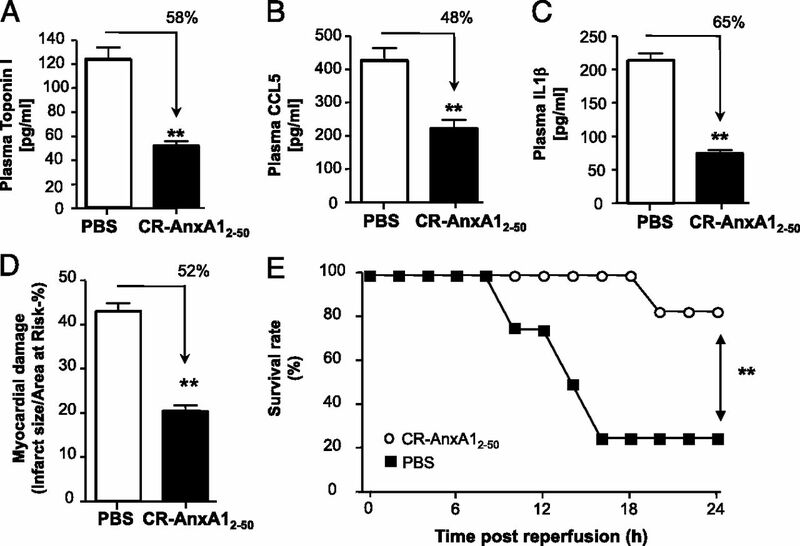 In line with these cardioprotective actions of AnxA1, when CR-AnxA12–50, the metabolically stable peptide, was administered 1 h into reperfusion, it retained its potent organ-protective actions affording marked reduction in 24-h mortality (Fig. 7). In conclusion, design of peptidomimetics based on the N-terminal region of AnxA1, recently shown to interact with the N-terminal extracellular portion of human FPR2/ALX (44), yielded peptides that bound and activated this homeostatic receptor with high affinity. These peptidomimetics afforded potent anti-inflammatory and proresolving actions in mouse and human systems. Moreover, generation of a protease-resistant sequence by substituting a single amino acid in position 25 yielded a peptide endowed with significant tissue-protective actions, possibly consequent to better in vivo pharmacokinetics and pharmacodynamics. Taken together, these findings suggest CR-AnxA12–50 may provide the basis for innovative therapeutic avenues in the treatment of acute vascular and organ inflammatory conditions. J.D., A.P.C., N.M., and M.P. are inventors on a patent application (no. 133302-465121/US) for the utilization of the AnxA1 peptides. The other authors have no financial conflicts of interest. J.D. designed and performed research, collected, analyzed, and interpreted data, and wrote the manuscript; A.P.C. designed and performed research, collected data, and contributed to manuscript preparation; V.R. performed research and analyzed and interpreted data; C.D.F. performed research and collected data; M.D.A. performed research and collected data; N.M. designed and performed research, collected data, and contributed to manuscript preparation; and M.P. designed research, analyzed and interpreted data, and wrote the manuscript. This work was supported by a collaborative project between Unigene Corp. and Queen Mary University of London and by the William Harvey Research Foundation. This work forms part of the research themes contributing to the translational research portfolio of Barts Cardiovascular Biomedical Research Unit that is supported and funded by the National Institute for Health Research.
. 2007. Resolution of inflammation: state of the art, definitions and terms. FASEB J. 21: 325–332.
. 2006. Annexin 1 and its bioactive peptide inhibit neutrophil-endothelium interactions under flow: indication of distinct receptor involvement. Blood 107: 2123–2130.
. 2000. Lipocortin 1 reduces myocardial ischemia-reperfusion injury by affecting local leukocyte recruitment. FASEB J. 14: 1867–1869.
. 2007. Aspirin-triggered lipoxins override the apoptosis-delaying action of serum amyloid A in human neutrophils: a novel mechanism for resolution of inflammation. J. Immunol. 179: 616–622.
. 2005. Modulation of phagocytosis of apoptotic neutrophils by supernatant from dexamethasone-treated macrophages and annexin-derived peptide Ac(2-26). J. Immunol. 174: 3727–3733.
. 2008. Annexin A1 in the brain—undiscovered roles? Trends Pharmacol. Sci. 29: 135–142.
. 2009. Modulation of experimental autoimmune encephalomyelitis by endogenous annexin A1. J. Neuroinflammation 6: 33.
. 2007. Activation of the annexin 1 counter-regulatory circuit affords protection in the mouse brain microcirculation. FASEB J. 21: 1751–1758.
. 2008. Increased susceptibility of annexin-A1 null mice to nociceptive pain is indicative of a spinal antinociceptive action of annexin-A1. Br. J. Pharmacol. 154: 1135–1142.
. 2012. Up-regulation of Annexin-A1 and lipoxin A(4) in individuals with ulcerative colitis may promote mucosal homeostasis. PLoS ONE 7: e39244.
. 2002. Endogenous lipid- and peptide-derived anti-inflammatory pathways generated with glucocorticoid and aspirin treatment activate the lipoxin A4 receptor. Nat. Med. 8: 1296–1302.
. 2007. Annexin 1 cleavage in activated neutrophils: a pivotal role for proteinase 3. J. Biol. Chem. 282: 29998–30004.
. 2006. Proteolytic cleavage of annexin 1 by human leukocyte elastase. Biochim. Biophys. Acta 1763: 1320–1324.
. 2001. Analysis of the protection afforded by annexin 1 in ischaemia-reperfusion injury: focus on neutrophil recruitment. Eur. J. Pharmacol. 429: 263–278.
. 2011. Annexin A1 released from apoptotic cells acts through formyl peptide receptors to dampen inflammatory monocyte activation via JAK/STAT/SOCS signalling. EMBO Mol. Med. 3: 102–114.
. 2009. Exploiting the Annexin A1 pathway for the development of novel anti-inflammatory therapeutics. Br. J. Pharmacol. 158: 936–946.
. 2012. Annexin A1 N-terminal derived Peptide ac2-26 exerts chemokinetic effects on human neutrophils. Front Pharmacol 3: 28.
. 2004. An annexin 1 N-terminal peptide activates leukocytes by triggering different members of the formyl peptide receptor family. J. Immunol. 172: 7669–7676.
. 2002. Production of salmon calcitonin by direct expression of a glycine-extended precursor in Escherichia coli. Protein Expr. Purif. 26: 249–259.
. 2008. Annexin 1 mediates the rapid anti-inflammatory effects of neutrophil-derived microparticles. Blood 112: 2512–2519.
. 2010. Anti-inflammatory role of the murine formyl-peptide receptor 2: ligand-specific effects on leukocyte responses and experimental inflammation. J. Immunol. 184: 2611–2619.
. 2001. Involvement of the receptor for formylated peptides in the in vivo anti-migratory actions of annexin 1 and its mimetics. Am. J. Pathol. 158: 1969–1973.
. 2005. Annexin 1-deficient neutrophils exhibit enhanced transmigration in vivo and increased responsiveness in vitro. J. Leukoc. Biol. 78: 639–646.
. 2005. Formyl-peptide receptor is not involved in the protection afforded by annexin 1 in murine acute myocardial infarct. FASEB J. 19: 100–102.
. 2009. Annexin A1 and glucocorticoids as effectors of the resolution of inflammation. Nat. Rev. Immunol. 9: 62–70.
. 2005. Molecular circuits of resolution: formation and actions of resolvins and protectins. J. Immunol. 174: 4345–4355.
. 2008. Opposing regulation of neutrophil apoptosis through the formyl peptide receptor-like 1/lipoxin A4 receptor: implications for resolution of inflammation. J. Leukoc. Biol. 84: 600–606.
. 2012. Cleavage of annexin A1 by ADAM10 during secondary necrosis generates a monocytic “find-me” signal. J. Immunol. 188: 135–145.
. 2010. Interaction of proteinase 3 with its associated partners: implications in the pathogenesis of Wegener’s granulomatosis. Curr. Opin. Rheumatol. 22: 1–7.
. 2007. Neutrophil elastase inhibition of cell cycle progression in airway epithelial cells in vitro is mediated by p27kip1. Am. J. Physiol. Lung Cell. Mol. Physiol. 293: L762–L768.
. 2010. Design and characterization of a cleavage-resistant Annexin A1 mutant to control inflammation in the microvasculature. Blood 116: 4288–4296.
. 2003. A calcium-driven conformational switch of the N-terminal and core domains of annexin A1. J. Mol. Biol. 326: 1317–1325.
. 2012. Hydrogen sulfide and resolution of acute inflammation: A comparative study utilizing a novel fluorescent probe. Sci. Rep. 2: 499.
. 2006. Cyclin-dependent kinase inhibitors enhance the resolution of inflammation by promoting inflammatory cell apoptosis. [Published erratum appears in 2006 Nat. Med. 12: 1434.] Nat. Med. 12: 1056–1064.
. 2012. Serum amyloid A opposes lipoxin A4 to mediate glucocorticoid refractory lung inflammation in chronic obstructive pulmonary disease. Proc. Natl. Acad. Sci. USA 109: 935–940.
. 2011. Immunopathogenesis of ischemia/reperfusion-associated tissue damage. Clin. Immunol. 141: 3–14.
. 2000. IMP and AMP deaminase in reperfusion injury down-regulates neutrophil recruitment. Proc. Natl. Acad. Sci. USA 97: 4267–4272.
. 2005. Annexin-1 peptide Anx-1(2-26) protects adult rat cardiac myocytes from cellular injury induced by simulated ischaemia. Br. J. Pharmacol. 145: 495–502.
. 2003. Cardioprotective actions of an N-terminal fragment of annexin-1 in rat myocardium in vitro. Eur. J. Pharmacol. 461: 171–179.
. 2012. Annexin A1 interaction with the FPR2/ALX receptor: identification of distinct domains and downstream associated signaling. J. Biol. Chem. 287: 24690–24697.